Commentary is provided by Lenny Leonard and Ron Niemi. The show opens with Joanna Rose interviewing the new EVOLVE champion, Drew Galloway. He shows the large bruise he has on the back of his leg after his match with Chris Hero yesterday, surmising he may be hurt, but says there is no way in hell he would miss the show tonight, especially as champion. He states that he will be defending his title in every match he is in going forward. This includes his opponent for tonight, Anthony Nese, who comes out to start the show. Rich Swann comes out and tells the Premier Athlete Brand that Su Yung was hanging out with him all night long yesterday evening. Yung’s face indicates guilt, so Nese and Konley yell at her as they head backstage. He then turns his attention to Galloway, giving him props for the match he just had. However, Swann was set to get a shot at the EVOLVE title tonight against Chris Hero, so he challenges Galloway so he can get the opportunity he was promised. Galloway is down, but the officials tell him that EVOLVE is now about how a performer does in a given weekend, so if Swann is able to beat Hero tonight, he will get a shot. Konley tells Gargano that this victory ended up being pointless, because he discovered during the match that Gargano is washed up and a shell of who he used to be. Obviously, with Gargano’s confidence already shaken, this weighs heavily on his mind. Frustrated, Hero shoves the referee. He then grabs the referee by the shirt. The referee warns him about being fined. Hero says he doesn’t care and slaps him in the face. He looks to hit him with a rolling elbow but thinks better of it. He leaves angrily out the front door, despite the fact that interviewer Joanna Rose wishes to speak with him. Another really solid outing from EVOLVE. Lots of good matches, character advancement, and plenty to make you want to see the weekend conclusion. 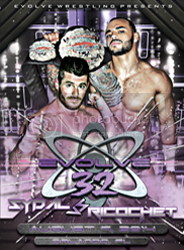 So far Chapter 2 of EVOLVE is off to a strong start, and if you picked up EVOLVE 31, 32 is wroth your while as well. You can purchase the show on DVD at DGUSA.tv or on VOD at WWN Live. For more information on EVOLVE, follow them on Twitter.